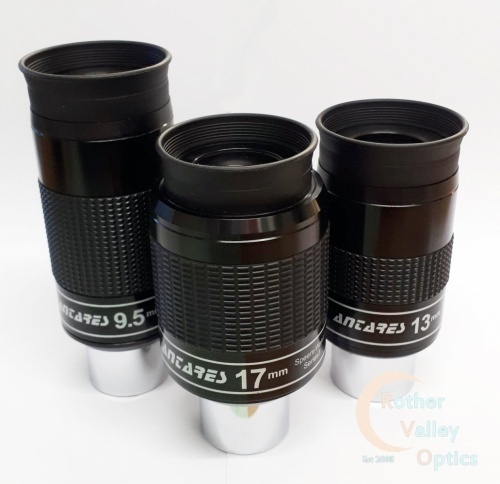 Antares Speers Waler Series 3 80° Wide Field Eyepieces 1.25"
Superior quality 80° eyepieces. Compared to eyepieces almost 3 times the price, the Series 3 SWA eyepieces compare very closely indeed. They feature a very high build quality and stunning optics. These have been personally tested by us and are pin sharp even in F5 optics. These are for the serious observer and offer breathtaking views of wide field deep sky. They are relatively lightweight so no need to re balance your dob when you use these. If your main interest is wide field deep sky, then these are the eyepieces for you.